Anyone care to guess just what is going on at ~1 min? it's repeatable. You mean the crash? That's odd. I have noticed that I have to set a higher minimum alt since the latest BDA patch due to a lot more ground collisions, but I'm not sure of the cause. Does changing the altitude settings help? I did try both radar, btw - nothing ever shows up. Also - words fail me. This is my design so far, a pretty standard construction. I'm still tweaking it and testing additional designs. It is quite heavy, but it does alright. @Van Disaster On that video your airplane is clearly flying way above the altitude I would recommend, it does not attack because it keeps going below the min altitude and pulls up instead. You should tweak that AI some more. @tetrydis Min alt for that flight was ~350m - it's clearly above that during the initial merge when it's being pretty aggressive. I'd set min alt lower but the pilot doesn't have much sense of self preservation. Wooh! Got around to finishing it just before my exam week. Good luck to everybody in the tourney! 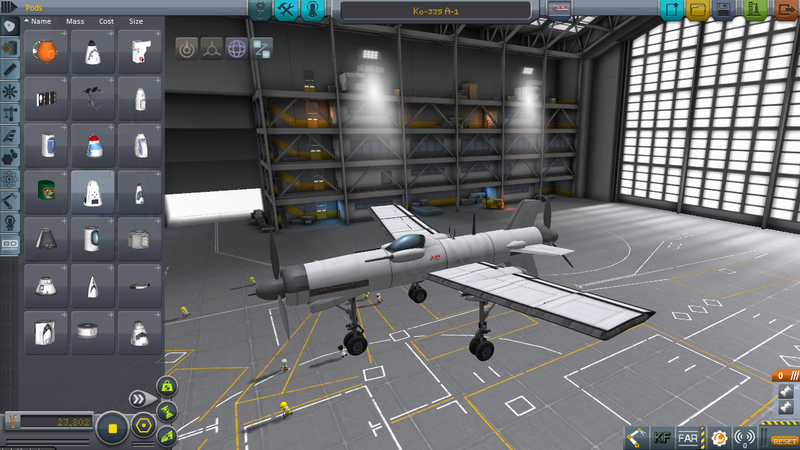 Does the Dry weight include the kerbal? Kerbals aren't a resource that is used up in flight so i would assume so. AFAIK a Kerbal adds 0.09735 T to a command seat. @Van Disaster: lower your default altitude. It always wants to climb back up to the default altitude and attack from there, but then it's too steep of an angle against a target that's below its default altitude and it decides to play it ultra-safe and pull out of the dive. Your AI settings would most likely be better for a BnZer, not a turnfighter like you've got. And it never gets to extend like it wants to because it's bleeding energy like it has a parachute on it in those turns. If you're gonna insist on it being a turnfighter, set up the AI for it to stick to low altitude shenanigans and work on it to make sure that it is actually capable of quickly getting right-side up and damping yaw oscillations to avoid going into the ground. Honestly, it looks like all your problems are just a case of designing for last war's AI. @ferram4: I had suspicions; I was trying to build a B&Z-er without drastically limiting pitch authority - killing pitch authority seems to really limit the ability to evade - but despite the g-limiter being set to 5 it still wanted to peg the meter & pull the wings off :S and you're probably right about designing for old AI to some extent. Probably makes a better turn-fighter anyway. Tetrydis: I doubt I'll be happy enough with anything to provide an entry unless you're short a craft to make up numbers, but let me know & I'll add something to the pot if you need it. Whoo, 23 submissions so far, awesome! If someone hasn't submitted yet, go for it, make sure you don't skip the deadline. Joined up just in time to submit my design. Having seen the videos from the last competition it should be interesting to see how the battles will turn out considering all of the improvements made in the mods used. And i think it would have to be 1 vs 1. The only problem with jets is that there is much less dogfighting and much more sniping, not as fun. *I also had a lot of stuff going on at the same time like music and some other things which may give extra 2 or 3 fps if turned off. Regrettably, I was quite busy the last few days and didn't submit. I guess I can wait for BAD-T 3? Or I guess I'll try submitting now and see what happens?